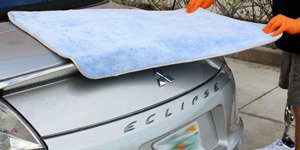 The towel dries my vehicle in half the time and you never have to wring it out. It keeps absorbing pass after pass over my vehicle. You will not believe how good this towel is. Last drying towel you'll ever buy. I've been using waffle towels from several different suppliers for years to dry my cars. Despite the price, I bit the bullet on this Big Blue and was stunned the first time i threw it on the car. It wouldn't;t move, like it as stuck to the roof. And when I did drag it off, there was nothing left behind. No streaks. Nothing. I've never seen a towel, microfiber or any material, with this kind of absorbency. I dried my small-ish car with it and almost heard the towel ask "Is that all you got?" You can't use it for anything else because it's so thick and gets incredibly heavy as it absorbs water. But I can't imagine a better drying towel than this. 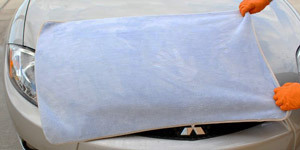 Towel exceeds my expectations, dries my full sized truck in no time.